You already have a space (or spaces) for the office and you want to design it. You are designing completely from scratch and need to decide how much space to dedicate to office spaces in your home and where to locate them. We'll be using the House Plans Helper activity based design process which takes you through a series of questions to get the requirements for your home office. Grab a piece of paper, go through this page and at the end of it you'll have a list of requirements. Then you can have a look at the other home office pages. 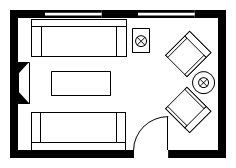 See the home office floor plans page or the small home office design page for some ready made layouts. You might find one that suits you. This page forms part of the home office design series. Let's have a think about all the activities that need to be considered for the design of your home office layout. Who needs a home office? The first thing to decide is who needs a home office. The requirements of the whole household need to be taken into account. For example, Mum might want a desk in the kitchen, the kids are going to have a play room with some study space (rather than have desks in their bedrooms) and Dad might only need a filing cabinet. Even if two people share an office space they will still have individual requirements to be met. 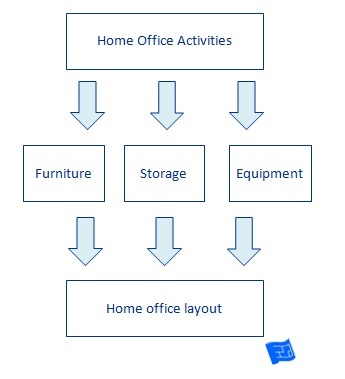 All the questions below need to be answered for each home office layout. What do you want to do in your home office? This is the most important question from which all the other answers will flow and it needs to be answered for each person that needs an office, even if the office space might be in the same room. For most of us a home office is somewhere to work at a desk, probably with a computer and printer and file a bit of paperwork (eventually!). If you want to be able to read then having a comfortable chair or sofa with a reading lamp in your home office can be a welcome addition. Your home office layout may not be as obvious as you first thought. Maybe you have a practical job or hobby. Do you want to sew in your home office? Fold Origami? Compose music? Arrange flowers? We could be here all day. Do you want to accomplish any other household tasks in your home office? Wrapping gifts for example. Will you need to have meetings in your home office? This will influence the layout, size and location. How much time do you expect to spend in your home office? If you’re doing general household administration such as school paperwork, paying the bills and surfing the internet a bit then you might be spending a few hours a week in your home office. This might require only a small office. On the other end of the scale, if you’re working a demanding full time desk job from home it could be the place you spend the most time when you’re at home. If this is you, spend the time you need to get your home office layout right. Do you want to be able to hide your home office space? If you like to be able to leave your work spread out then it can be psychologically beneficial (not to mention more aesthetically pleasing) to be able to ‘close the door’ on your office space. If you’re considering an office nook where a standard swinging door may not be suitable, a bi-fold door or pocket door, or maybe even a curtain might meet this purpose. The other option is to include a room divider to shield your home office from view from other parts of the home. What’s the best place for your home office? Would a homework room or communal home office layout meet your needs? Homework rooms are gaining in popularity. These are usually located near the main living area of the home, so that adults can supervise how much work is going on and what's on the computer screen. By a 'communal office' I just mean a homework room where the adults are welcome as well - one big office for the whole family. What do you need to store in your home office? Filing system (filing drawers, pin boards, in tray), stationary and books for starters. How about wrapping paper, photography equipment, craft equipment and other specialized items related to your individual activities. It's likely that you've already got these items. Write down the storage space you need for each one by measuring the place where they're currently stored. Add on or take away a little bit of space if you'd like more or less storage space for each item. What office equipment will you use? If you want to house a computer with a big box, where is the big box going to go? How about your printer? Do you have a shredder? All this equipment needs to be stored, or sit on the floor, or a shelf or on the counter or desktop. If you have any preferences for how any equipment is to be stored, make a note of it. I always think a desk lamp lends a homely touch, and I have a little heater to keep me warm in my office when the central heating is off. Built in or a piece of furniture? What height should the desk be? If it's an office for multiple people will the desks be around the edge of the room, in a row, or facing into the middle of the room. There’s a bit of a movement out there for standing desks so that we’re not sitting down all the time. Well here’s an idea that’s a win, win, win. How about a bar height desk? That way you can stand if you like, sit if you like (on a comfortable bar stool with a good foot rest) and there’s more storage space underneath than with a desk at the normal height. If you're planning to have a chair on casters for your desk chair think carefully about your office flooring. Castors will make loose rugs and most domestic carpets ripple underneath. Think about buying one of those plastic mats that goes on top of the carpet, or using the same carpet that you'd find in an office block - maybe carpet tiles. Do you want the storage furniture (filing cabinets and drawers) to be built in or do you plan on having individual pieces of furniture? A built-in arrangement might means that you can maximize every inch of space you have in your home office layout because it's custom built. The downside of using built-ins is that you can't move things around if you want to try a different arrangement. Using stand alone furniture has the opposite advantages and disadvantages. You can move around but you might not maximize your space.